It is no secret that we at Suddenly Solo heartily endorse spending time with your family. It is important on many levels but it can present challenges when your extended family includes infants and toddlers as part of a travel group. There are physical demands when it comes to keeping up with very young children that you should consider. Don’t assume that the youngsters will sleep or nap most of the time since new surroundings are very stimulating and unfamiliar sleep settings and time changes can play havoc with even the best of domestic routines. 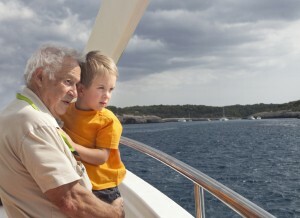 If you take a vacation cruise, you may find out quite quickly that a huge ship gets quite tiny when you have little ones to tend to (and your kids may feel that your role on this kind of trip is a full-time babysitter). Check to see what facilities are available on board before you book this kind of trip and if they require (or don’t allow!) parental supervision to use them. Some of the “cool” activities may have special restrictions. We can’t help but remind you of recent cruise ship “problems” if you are considering heading out on the high seas… it’s one thing to be inconvenienced when you are our age but it’s quite another when you are dealing with young ones. Plane travel with little ones can be an adventure in itself. You have to consider clearing security with strollers, etc., that can get you some glaring looks from those behind you on a long TSA screening line! If you have a low tolerance for the possibility of having to tend to a screaming or otherwise uncomfortable grandchild, you may want to book a different flight and meet them at your destination. If you are considering a trip out of the country, investigate the GOES (Global Online Enrollment System) from U.S. Customs and Border Protection to speed up the customs process and to avail yourself of the Trusted Traveler Network lines domestically. Visit https://goes-app.cbp.dhs.gov/ for more information. Don’t assume the words relaxing and vacation will be in the same sentence. Beach reading is out; reading after the toddler goes to bed at 8:00 is in. Sticking to a child’s usual schedule, give or take an hour, really does help. Kids are curious and resilient if you allow them to be. Three restaurant meals a day is two too many. Pack a lot of extra clothes and Tide pens. The snacks you pack will come in handy. Those who have done this kind of travelling have found that each time they travel, as the kids get a little bit bigger, and they’re a little more experienced, it does get easier. So before you go, be sure you know what you are getting into by researching destinations in advance, considering the “getting there” process, and establishing some ground rules with your kids to be sure you aren’t going to be taken advantage of in spite of your best intentions! Copyright © 2019 Suddenly Solo. All rights reserved.